Arrival back in Langkawi on the ferry from Koh Lipe was straight forward in comparison to the departure. We simply had to wait for our passports to be returned at the Malaysian immigration office, have them stamped for re-entry into Malaysia and grab a taxi. Before the trip to Lipe, we had left most of our stuff in storage at Berjaya resort, just taking essentials and our snorkeling gear with us. So the taxi had to drive 20 mins in the other direction so we could to collect them, then retrace the route and drive all the way to Frangipani resort in Pantai Tengah. I’m sure the driver didn't mind the extra fare. The sun had just set as we entered our room. Once unpacked and refreshed, it was time to find dinner and a cool drink. 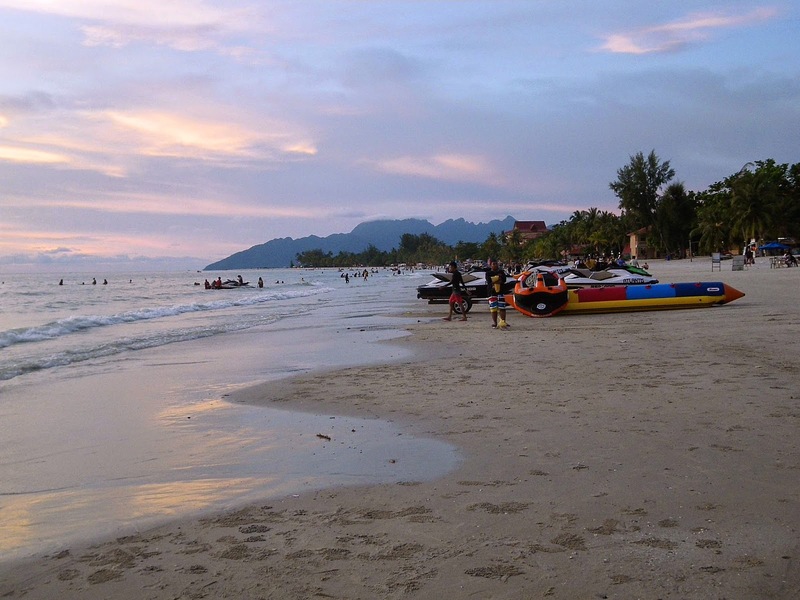 From the resort, the main or busy part of Langkawi, Pantai Celang, was a good kilometre up the road and over a ‘T’ intersection. We didn’t get far down the main street before we found “Little Mexican” restaurant. J and I walked straight in without a word, both knowing it had to be done. We’d seen another Mexican restaurant further down the road from the taxi, but this was so much closer, and we couldn’t be bothered walking any further. Crowded, we were lucky to be allocated the last available table and quickly had cold margaritas in our hands. The food, service and staff were all excellent. Not long after we arrived, the heavens opened up and a sudden thunderstorm hit. Such a shame really, as it meant we had to stay and have another drink until it cleared. What a terrible tragedy! We agreed we would have to come back before heading home. Having stayed up late watching a silly movie until well past midnight the night before, we slept in a bit the following morning, just making it in time for breakfast at the hotel before they packed up. The plan for the day was that there was no plan. 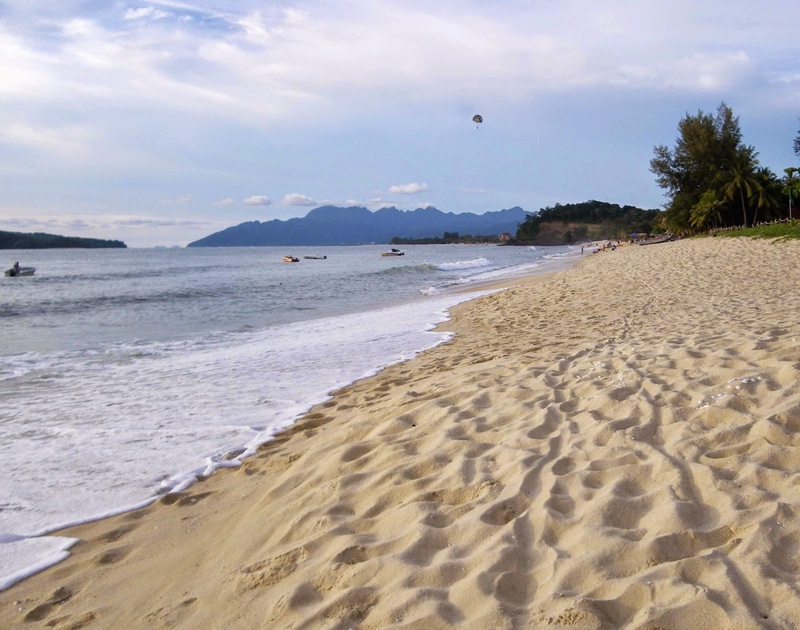 Just mooching around the hotel, a walk on the beach, and checking out Pantai Celang. 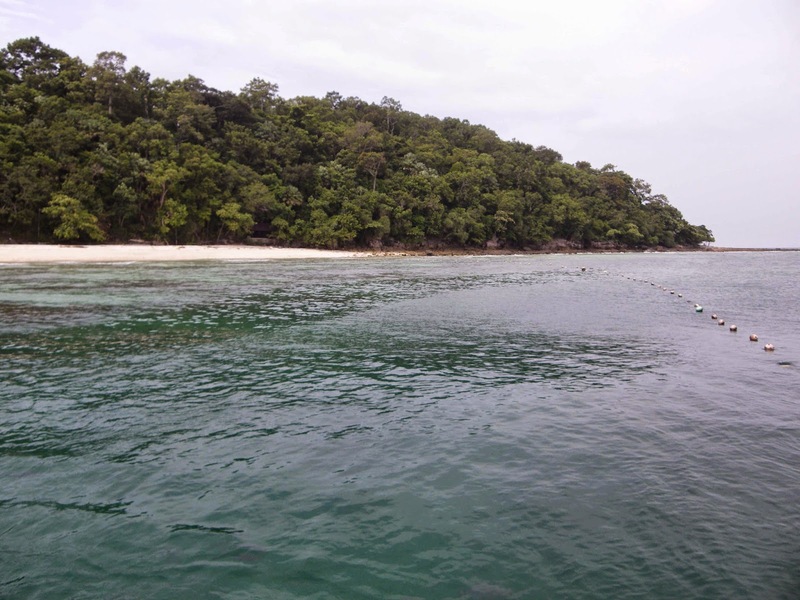 We wanted to do more snorkeling and found out that the only real option was on Pulau Payar, which could only be reached on via a tour operator. Walking up and down the main street, we found many tour desks all selling more or less the same tours. To decide, we simply picked the friendliest and least pushy, which was a tiny shed-like stall across the road from the Cenang shopping mall staffed by a lovely young lady. 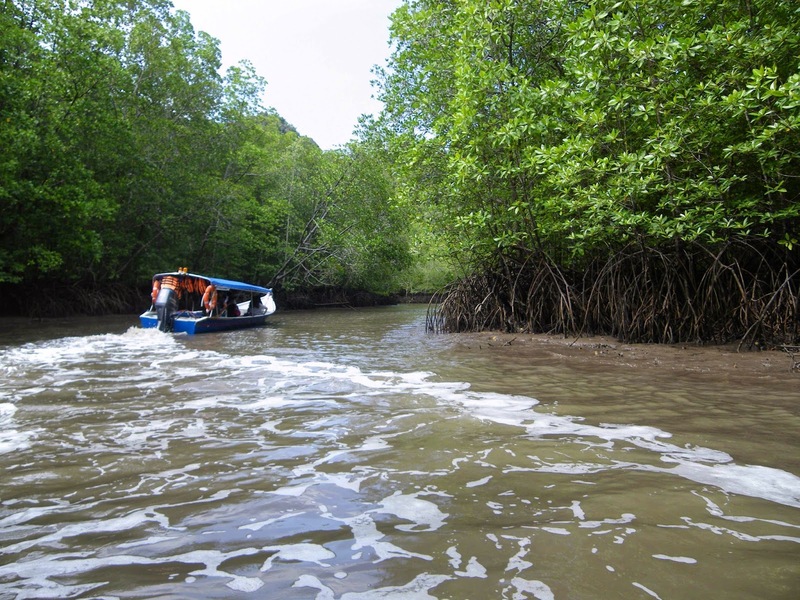 We also chose to book a mangroves tour with her to see the Kilim national park. After a leisurely lunch at one of the cafes, we spent the afternoon lounging around the pool back at the resort. Shaded by the palms and trees around the resort, the pool was especially appealing without the burning sun to scorch us while trying to cool off. I even managed to finish reading a novel while J had a nap. Heading back out for dinner, we carried the hotel’s large umbrella. A young local woman at one of the shops commented about how we were prepared for the unpredictable weather, laughing that she was caught out last night. Walking all the way to the end, I spent a bit of time looking in at the shops, many open late afternoon that did not open earlier the day. Mostly tee shirts, clothes, batik bags and the usual tourist trinkets were on offer, but it was always good to browse for a little treasure. We stopped at a beach bar in a busy part of the strip for a beer and to watch the sun set. J had never seen so many parasailers. It was surprising to see how many took flight after the sun had set and the sky was growing dark. Tired and hungry, we ended up choosing ‘Indian Palace’ restaurant near the end of the strip. The enticing smell of fragrant spices and rich curry wafted out to the street making my mouth water. Unfortunately, it was a disappointing experience. After ordering, we noticed large trays being brought out and placed along a sideboard over burning candles. Not long after, a large bus arrived and out poured about forty people, obviously from a tour group. That wasn’t the problem – the issue was that no-one else in the restaurant were served while the buffet was in swing. To top it off, a random guy started busking, playing a few old rock songs, not all that well, who then came to all the tables pretty much demanding money. When a French couple at the next table told him off for being rude, the resulting fracas almost ended in blows, with much swearing and unpleasant exchanges. The busker finally left and our meal finally arrived. It wasn’t bad, but after the long wait and drama our appetite had been ruined. 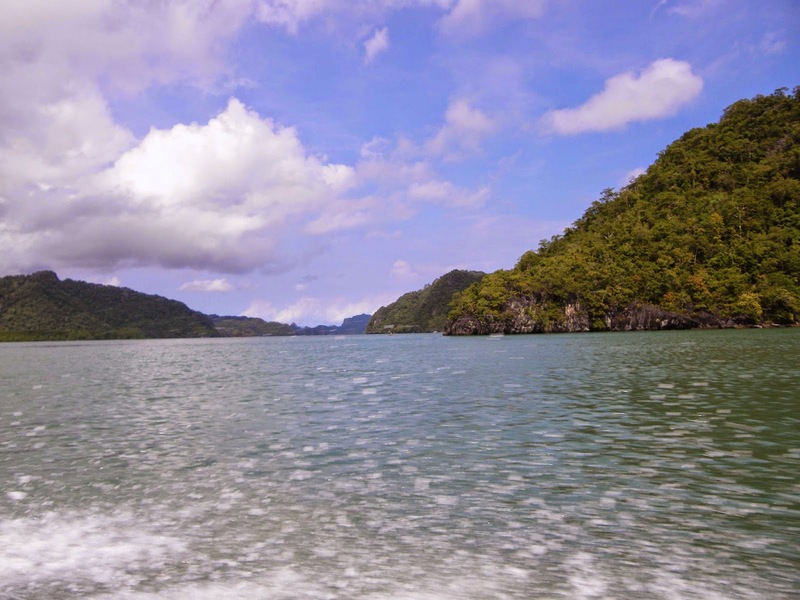 Low cloud and choppy seas met us at breakfast the next day – the day we had booked to go to Palau Payar. We had heard thunderstorms during the night but had hoped they would clear to a clear blue skies, as happens a lot in the tropics. Slightly damp after a long wait for our late pick up, we headed to the port at Kuah for our boat out to the island. The large ferry was quite comfortable and we arrived at the island after a mostly smooth ride. 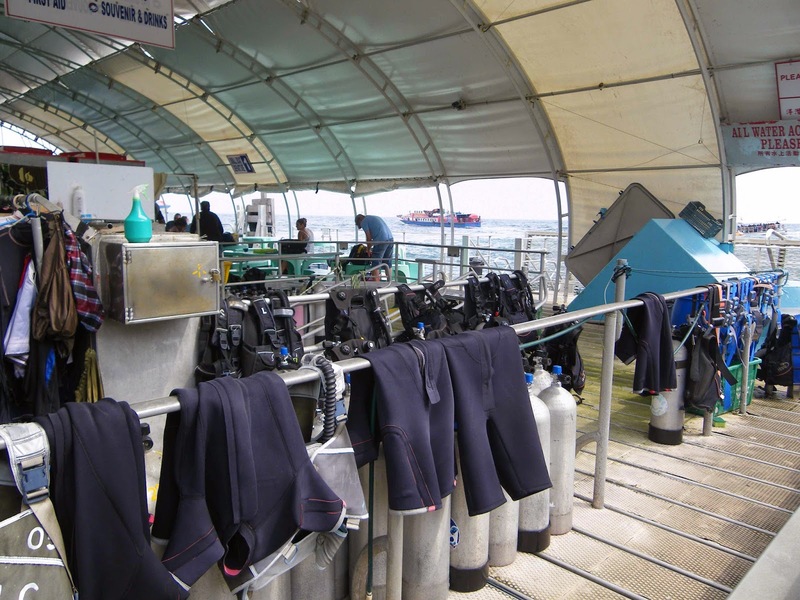 Anchored about a hundred metres off the beach, a large platform reminiscent of an oil rig provided a base for visitors, including an underwater observatory and jetties for boat docking. The wind had dropped and the cloud seemed to have thinned out by the time we jumped in the warm waters of the Straight of Malacca. 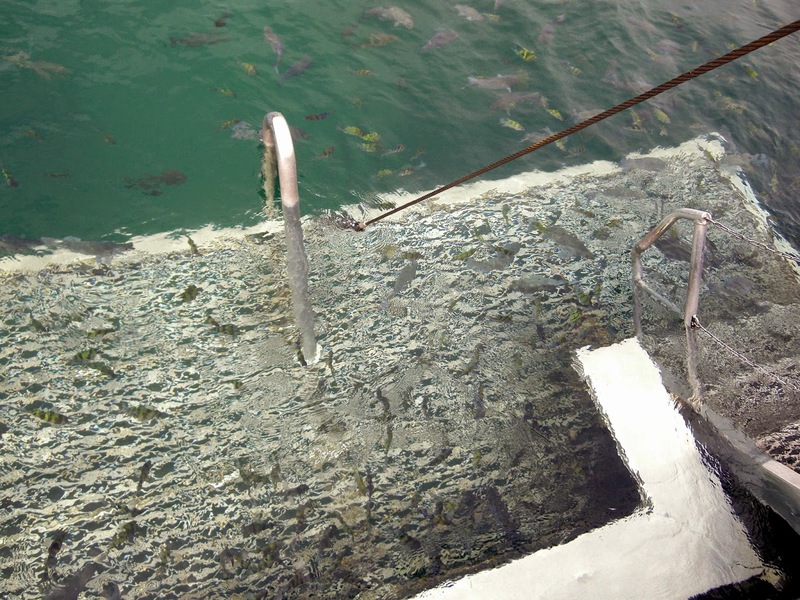 Deep below the diving platform, there was a large school of trevally schooling in the gloom. Many damsels and fusiliers hung around hoping for scraps. Many other visitors in our group were not strong swimmers so made use of life vests and guide ropes. 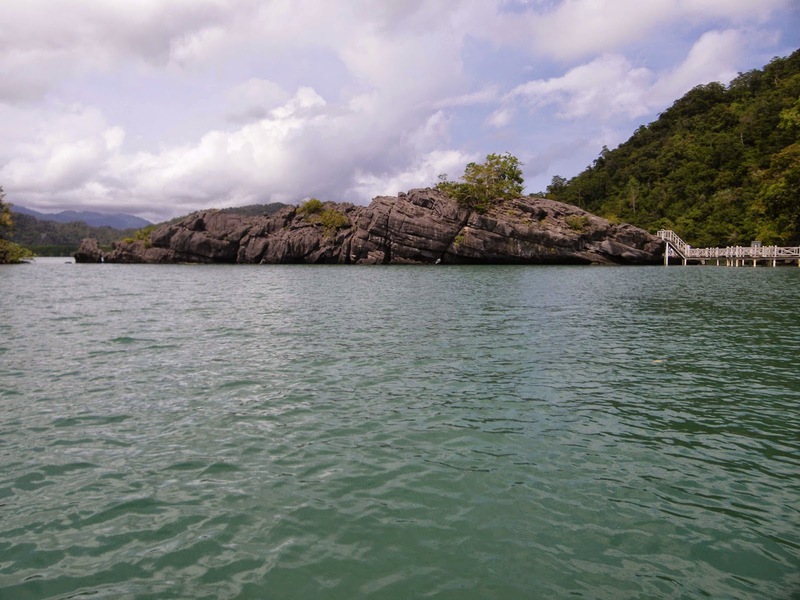 J and I swam away into ten to fifteen metre deep waters with rocky coral outcrops quite a long way below our fins. Highlights of our snorkelling included a large black and white striped water snake that surfaced for a breath almost directly in front of me; a large potato cod that didn’t like company; and many anemone fish that always came out of their anemone homes to, as I call it, ‘tell you off’ and try to drive you away. They really are quite aggressive, though completely harmless. Of course we also saw many colourful parrot, trigger and other tropical fish. Under the platform in the dark shadows barely visible from the observatory, a small school of bat fish hung out waiting for the commotion to go away so they could return to their regular grazing grounds. Lunch was a basic buffet with stir-fries, curries and seafood, along with rice, traditional Malaysian cakes and sweets, and lots of fresh fruit. More than ample for us, much of the left over rice went overboard to the fish. Little put-put boats took groups of people over to the beach area. In the shallows only metres off the beach, baby black-tip reef sharks patrolled along with other fish, looking for a meal. The juvenile sharks did not care about the many human legs right in front of their face. So many people were in trying to touch them as they wove in between legs attempting to avoid collisions. I felt very sorry for these babies with so many human invaders. At least we all left their home at the end of the day so they could continue in peace - until the next boat load arrived. As the afternoon went on, many other visitors were either a) over snorkelling and happy to chill out or nap; or b) sea sick; many in the latter category. The boat ride home wasn’t as pleasant due to the many retching people, made worse by a choppy sea. J and I are not affected by motion or sea sickness (thankfully) and felt so bad for the many people near us who really struggled with the trip home. Back on dry land, the tour operators made an interesting announcement, “the busses back to your hotels will leave in about twenty minutes. If you go shopping, the busses will not wait and you will have to make your own way back to your hotel”. You see, Kuah port also has a large shopping centre that you have to walk through on the way to the boat jetties. 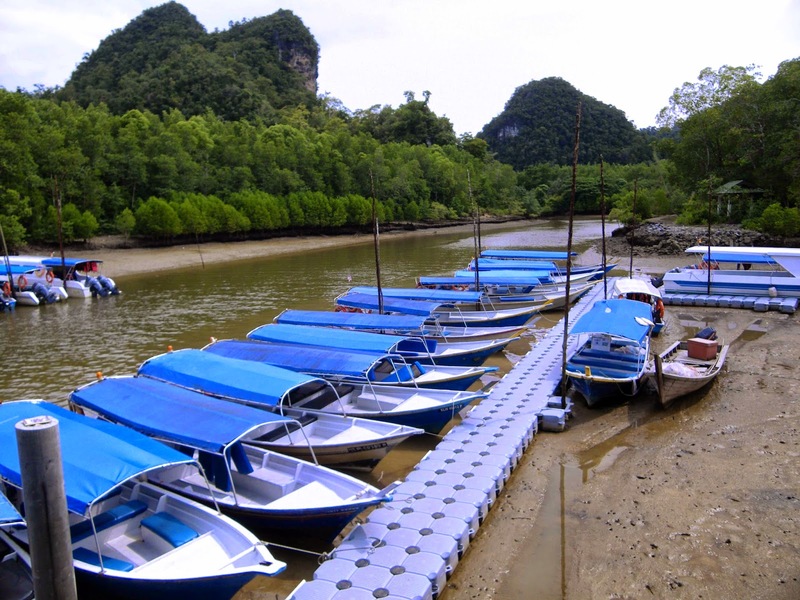 Many boats leave for Thailand from the port so there are numerous duty free stores. 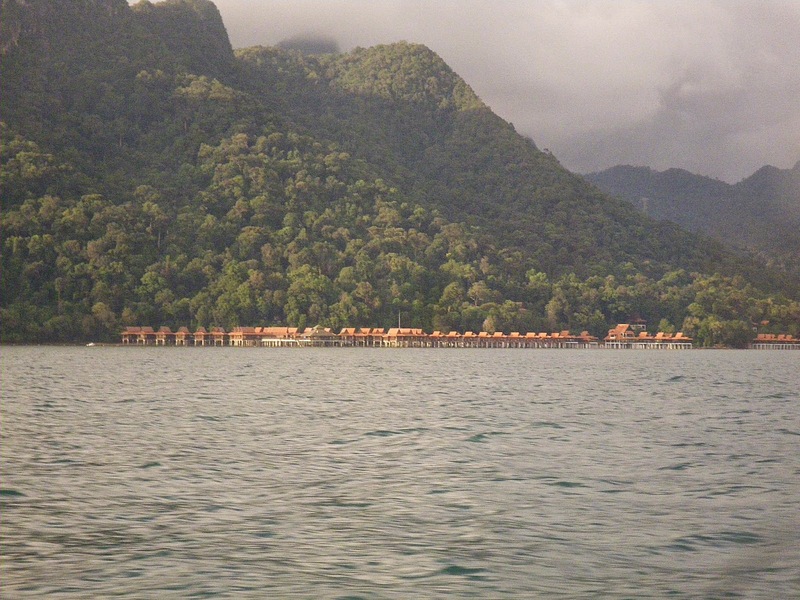 Langkawi is well known for duty free goods, particularly chocolate. Our next day began similar to the one before, waiting to be picked up for a tour. We were up early after an early night staying at the hotel for dinner and a little tired from snorkelling. 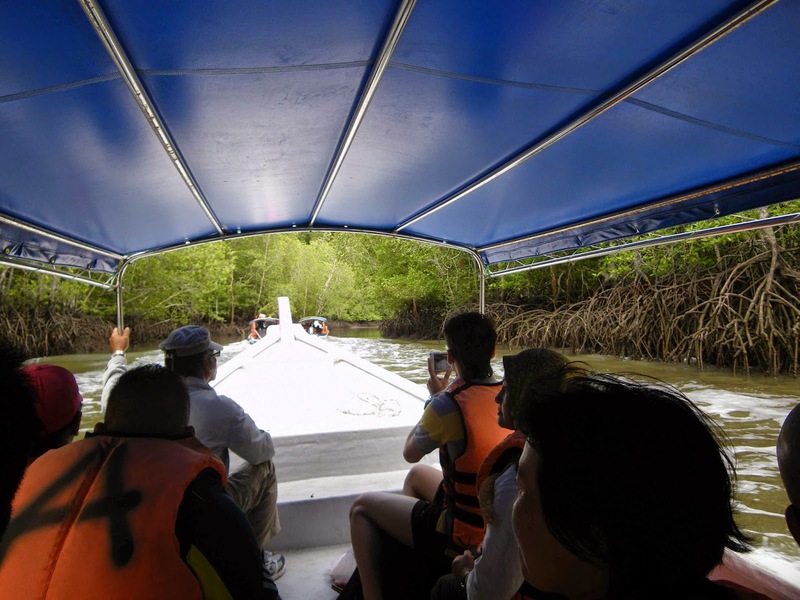 The ‘De Baron Mangrove sightseeing’ tour promised to take us to explore more than ten places of interest, going “further to outskirt mangrove coverage”, so says their brochure. The mini bus to Kilim Jetty took us through a few places in Cenang and Kuah to pick up other passengers. At the jetty, the group of about twenty eight were split into three groups and assigned a boat for the tour. The guide (whose name I can’t recall) rode on the bow of our little boat, as our boat had less passengers than the other two. He told us a lot about the Kilim park, it’s history and geology along with local customs. Cracking a few jokes in for good measure, he also spoke a few languages and was a really good guy to show us around. Our little flotilla set off down the Kilim river, visitors with cameras’ blazing. 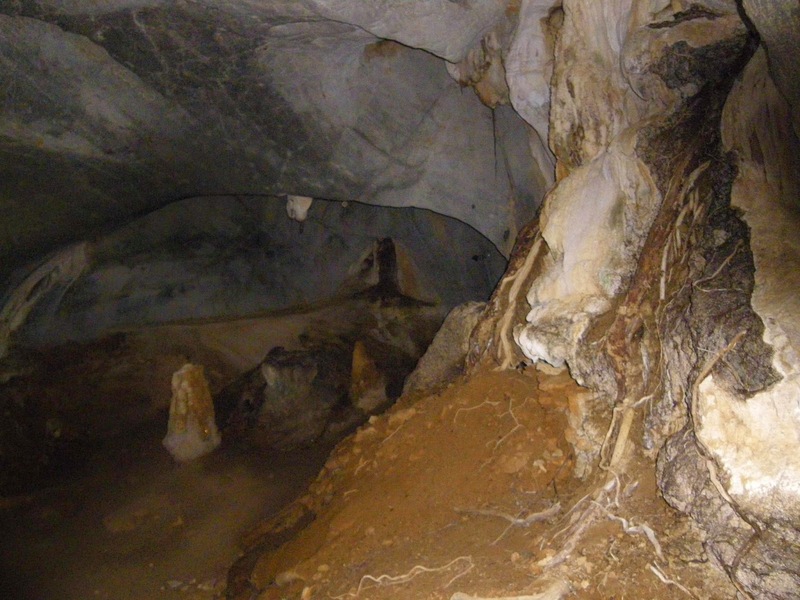 First stop was the ‘Bat Cave’ or Gua Kelawar. 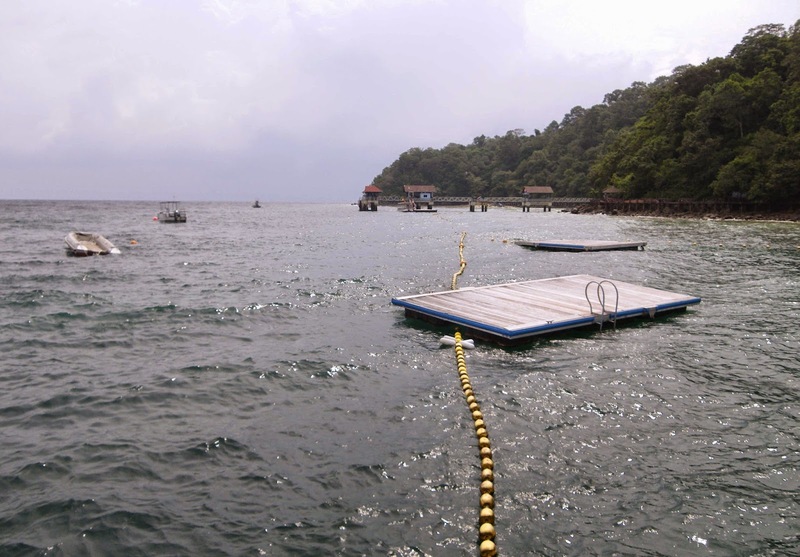 Many other boats and tour operators were also crammed onto the small jetty. Construction was underway to expand the docking area. 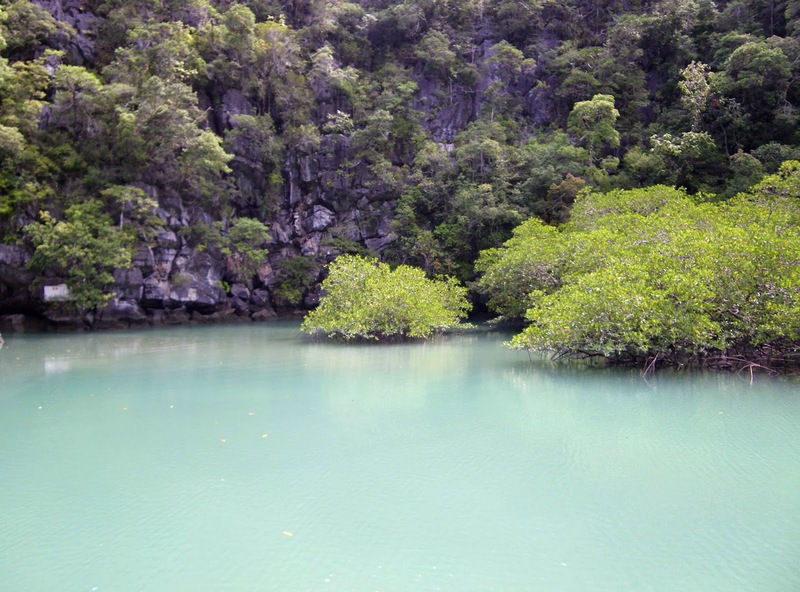 A short circuit walk allowed you to go through the cave where a few dozen bats slept lazily, then out onto boardwalks to see an ancient shell fossil and mangroves. 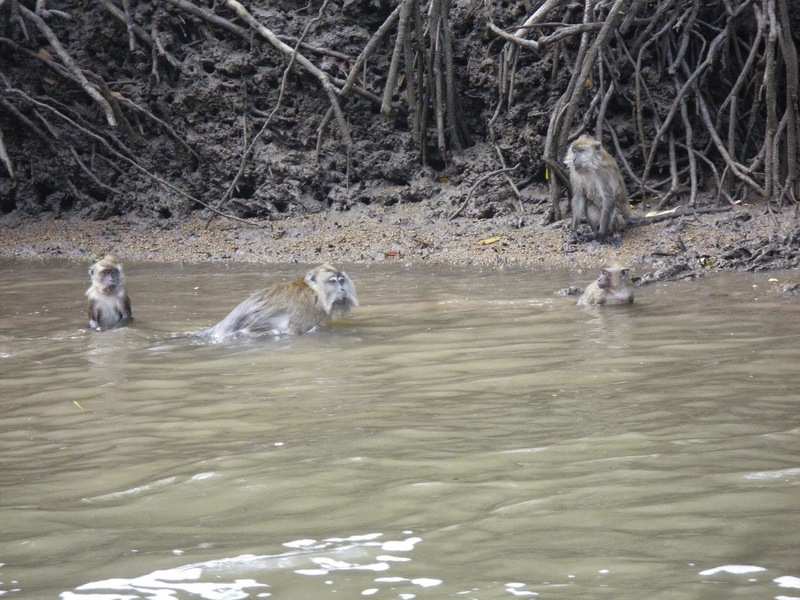 A few macaques hung around in the trees near the cave’s exit, hoping to con some food out of the visitors. Weary, two young girls from our group were frightened by them, and took a lot of encouragement to continue on past them. Back on the boat, we continued down stream to where the Kilim river meets the sea. There, the “Geopark Icon”, which is a sign similar to the famous ‘Hollywood” sign in Los Angeles, was mounted on the side of a limestone cliff. 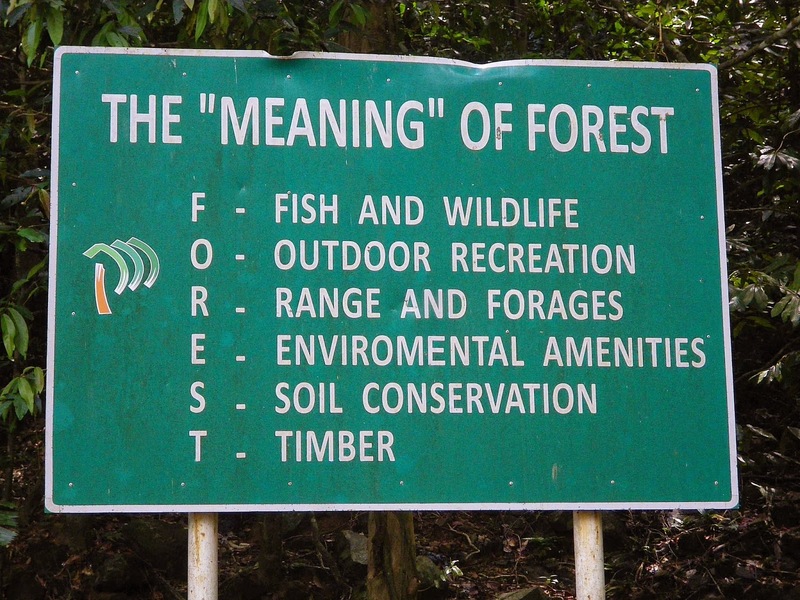 It says “KILIM GEOFOREST PARK”. All the boat drivers maneuvered the boats this way and that allowing all us tourists to take photos (i.e. mostly selfies) with the sign. Our guide also took the opportunity to tell us more about the formation of the karsts. Gunning the engine, we set of to our next stop, ‘Fossil Island’ or Palau Anak Tikus at great speed. Many fossils are embedded in the rocky outcrops of the small island. A concrete walkway had been built to allow us visitors an easy route to see some of the fossils, many on other less accessible parts of the island. 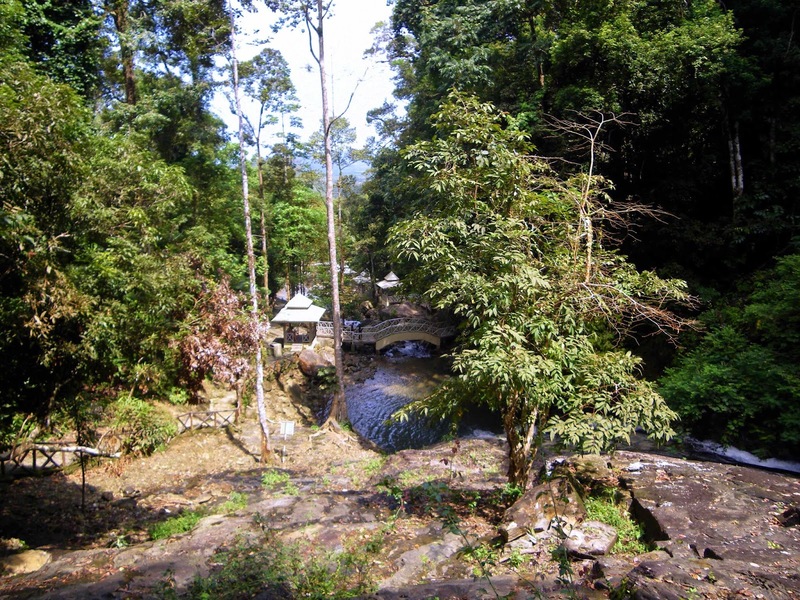 Not far away was our next stop of ‘The Hidden Lagoon’, or Gua Langsir. From the drop off point, it was a little walk over another concrete walkway, then up and over a small but steep hill to reach the lagoon. 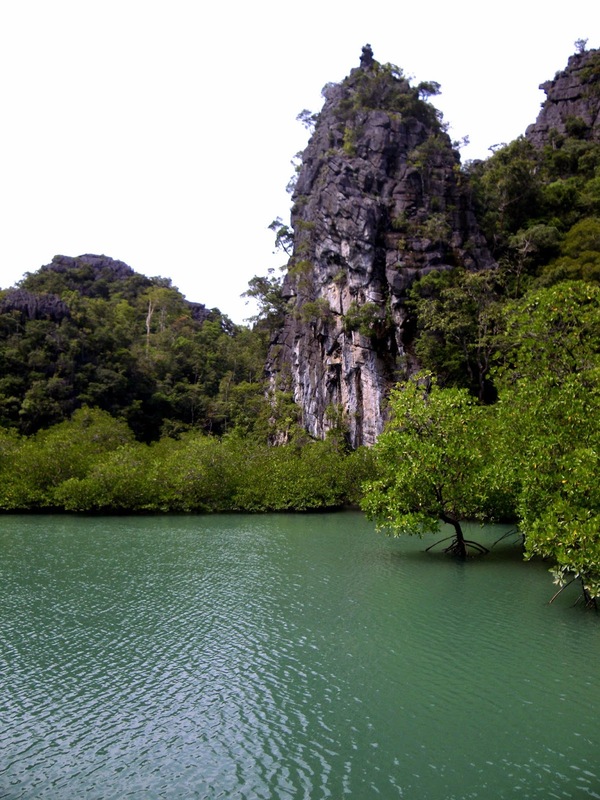 Similar to the famous ‘hongs’ in southern Thailand, this island had limestone cliffs on the outside, but was ‘hollow’ on the inside, with a eroded ea cave allowing the tides to bring the ocean into the lagoon. Cloudy aqua blue, it looked an ideal place for a dip, and a serene little spot that I found really lovely. 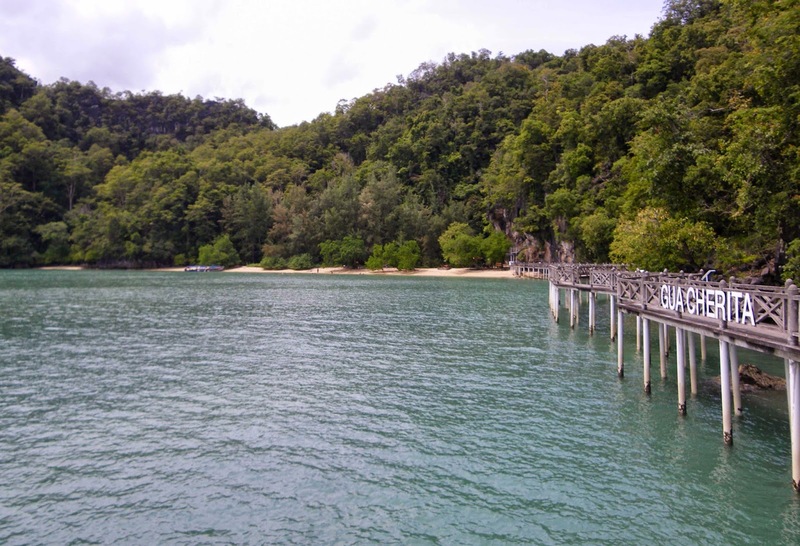 At the northern most part of Langkawi, our next stop was at Gua Cerita. 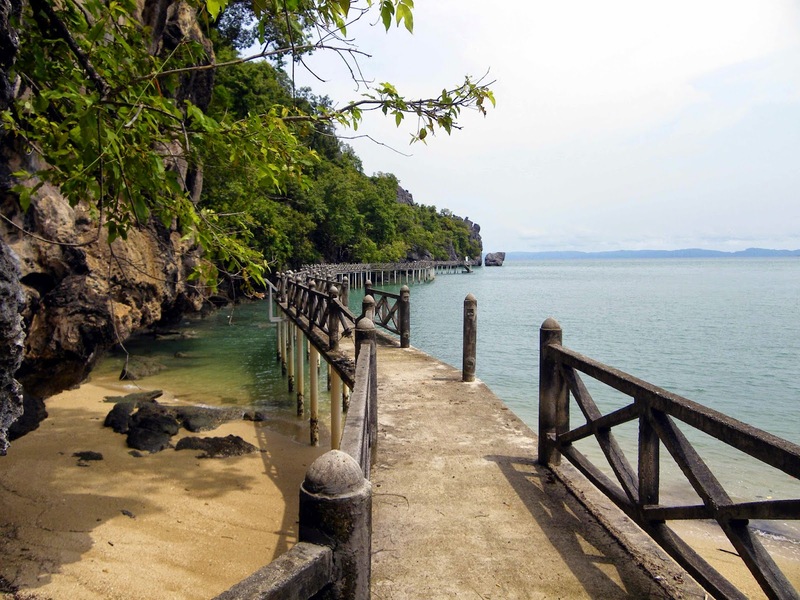 From the info-sign; ‘Easily accessible by boat from Tanjung Rhu, the cave can be reached with a climb up a wooden ladder. 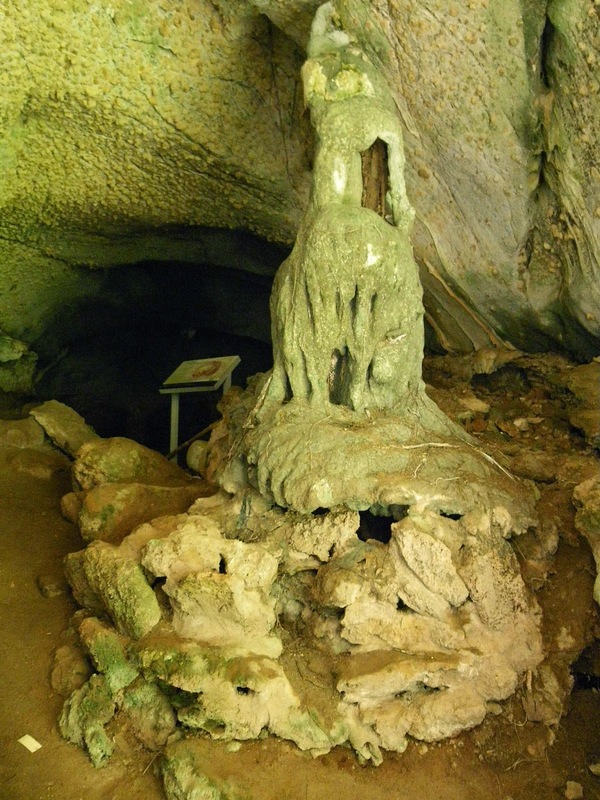 Legend has it that Gue Cerita, or Cave of Legends, is linked with the mythical battle of the big birds. It was here apparently that the Princess of China was kidnapped and held captive. Faintly visible on the walls of the cave are some ancient inscriptions said to be verses from the Holy Koran’. We couldn’t see the inscriptions, but there were a lot of more recent inscriptions on the cave’s wall. Beside the cave was a nice little beach, presumably Pasir Panjang as it wasn’t signposted, where many of the group chose to have a swim or sunbake. J and I walked around a bit along the long jetty, checking out the cliffs and other rocky islands from the end. It was here that something almost unbelievable happened. A boat came in close to the beach with two couples aboard, the men dressed in white, the women draped in black. One of the men started yelling at us (I don’t know what language it) as well as making ridiculous sounds and hand gestures, similar to what you may associate with childhood games of a ‘bogey man’, like ‘boooollloooommmooggooo’ (if you can sort of imagine). As first I thought they knew our guide or others in our group and were having some fun. But then the boat sped past and then doubled back for the man to perform this moronic display again. After a quick circle close to shore, the boat sped off again. For a minute, none of us knew what to say. Shell-shocked by the absurd display, we slowly had a laugh about it, agreeing that the guy must be on drugs or crazy. I turned to J and had to ask him whether it had really happened. It was just so surreal. J and I mused that we hadn’t reacted quick enough, as we should have tried to video or take photos to prove that it actually had happened. Lunch was at a floating fishing farm. On arrival, a local boy showed us through the various ‘pens’ housing huge crabs, sting rays, eels, trevally, a very tormented puffer fish that was made to display how he puffed up for us, as well as other large fish including some colourful trigger fish. The meal was comprised of a brothy tomato soup, stir fry noodles and fish, and fresh fruit, more than enough for us, but a few others order other dishes available from the kitchen. 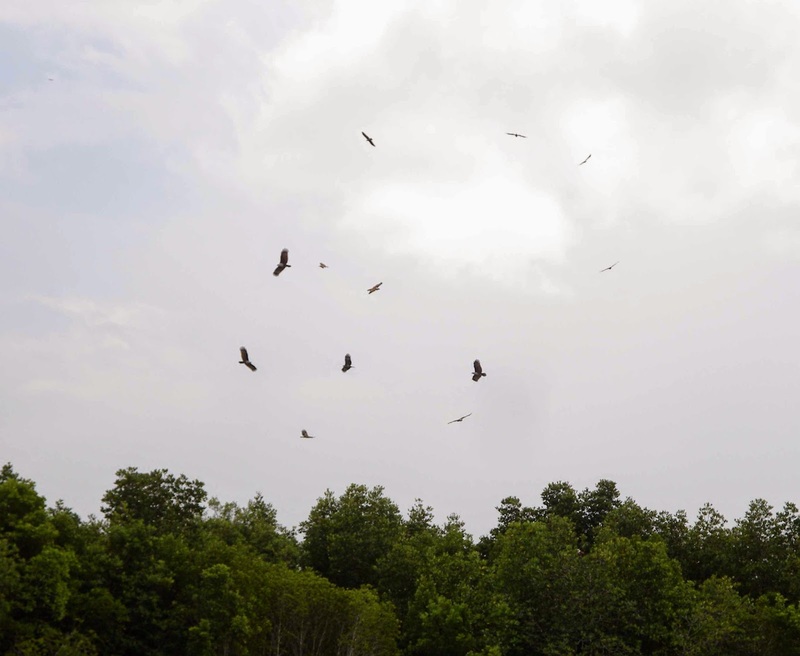 The return journey included the much advertised eagle feeding, not far from the fish farm. 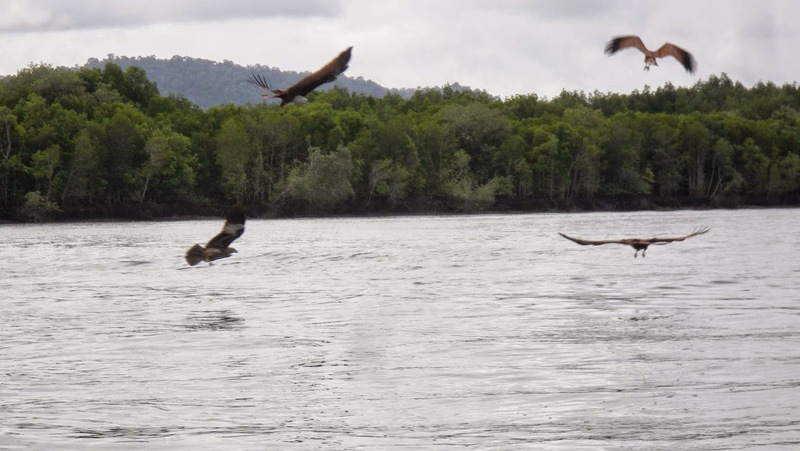 The boat drivers each had a bag of shrimp that they threw out of the boat to waiting eagles, who swooped down and snatched them off the water’s surface. Sure it’s a spectacular thing to see, but I worry about the eagles and the effect it has on them and their natural hunting and feeding habits. After feeding these magnificent birds, we navigated through narrow, river like channels to where troops of macaques lived. 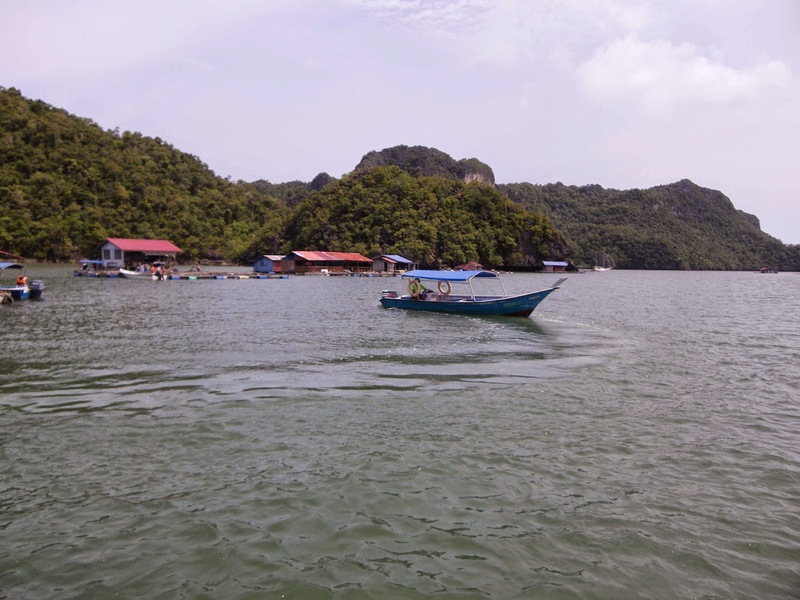 Familiar with the tourist boats, they came out and scampered through the shallow water, some onto the boats, hoping for peanuts that the boat drivers threw to them, and anything else they could steel from the passengers. Again, it was a lot of fun, but not sure about the effect on these cute and cheeky monkeys. Further along the canal like inlet was the Crocodile cave, named for a rock near the entrance that looked like a crocodile’s head sticking out of the water. 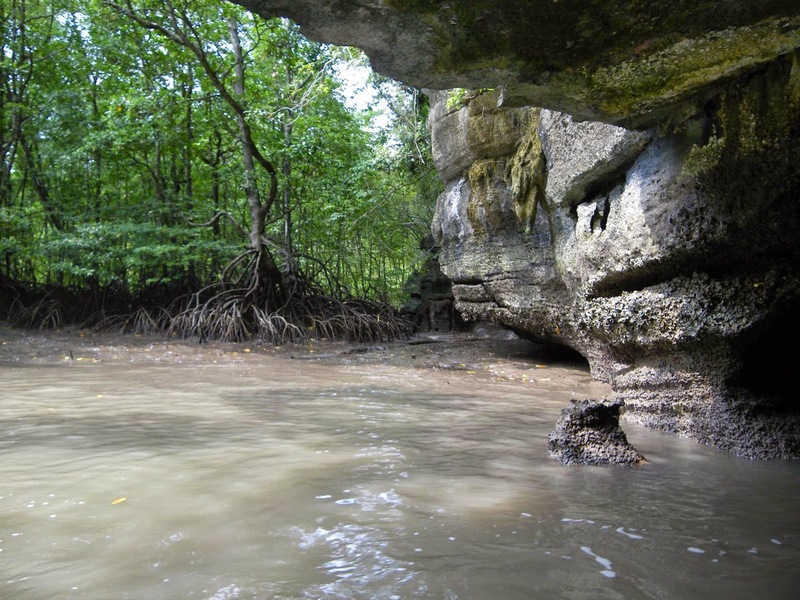 Boats could pass through the hollow cave when the tide wasn’t too low. 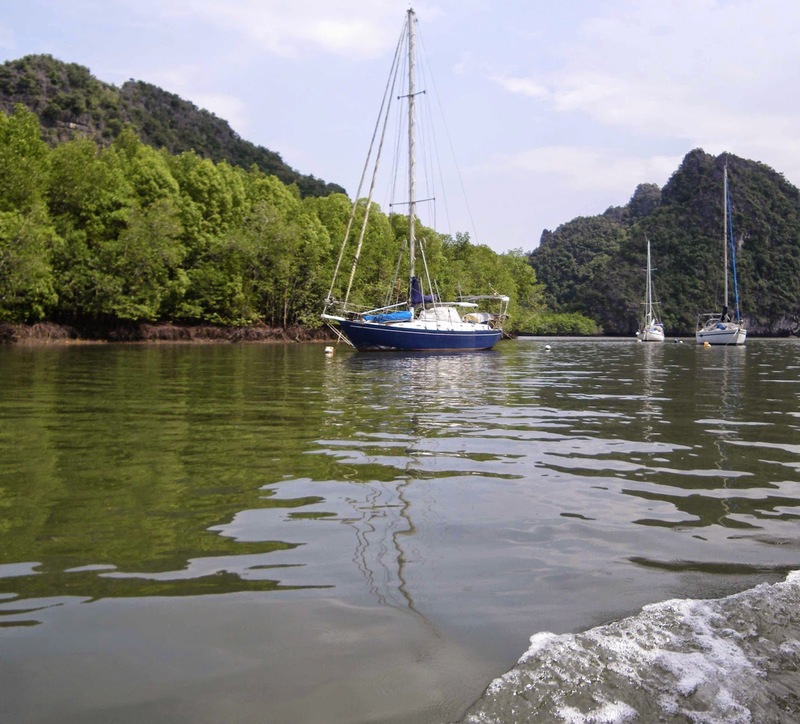 From there, we continued along past a marina of sorts, where expensive looking yachts were moored away from the rough ocean swells in these quiet back waters. Back at the jetty, the tide had gone out leaving the muddy banks exposed. Mud-skippers and crabs were digging through the soils looking for food. We thanked out guide, and bid farewell to the rest of the tour group before being driven back to the hotel. That night, having already scoped the shops’ wares, I bought a few tee-shirts and tie-die pants, along with the obligatory fridge magnets and little knick-knacks for family and friends. Dinner was at the “Taj Mahal’ restaurant. We initially had walked past as there was a hawker out the front trying herd people in. J and I avoid places that try to push you into their establishments. But when we walked past again, no-one was out the front, leaving us to look at the menu at our own leisure. The delicious smells emanating from the tandoor near the front persuaded us to give it a go. And what an excellent choice it was. We both had entrees from the tandoor (paneer for me, chicken for J), along with freshly baked breads and a veggie curry. It was all really delicious. Staff were attentive but the décor was a little, um, kitsch. Not to mention the very reasonable price – highly recommended. 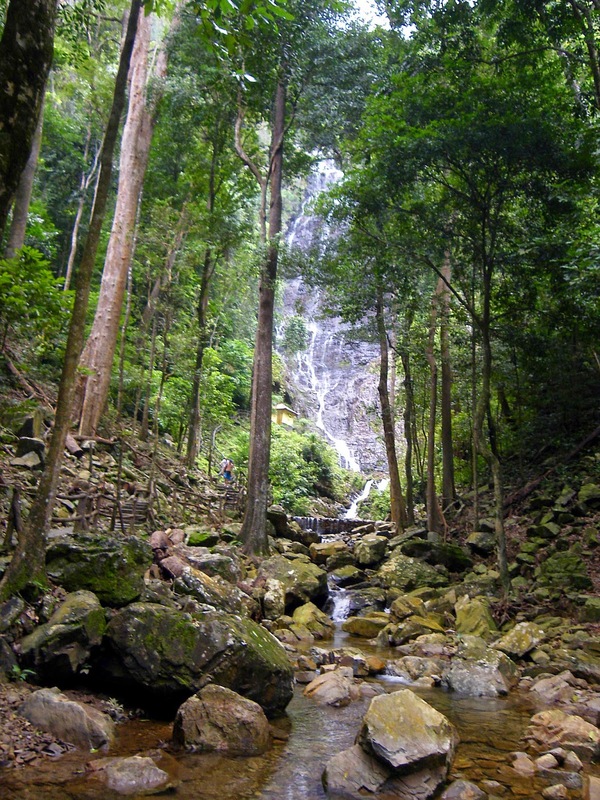 Our last full day was spent with a driver (hired off the street) visiting the waterfalls of Langkawi. We wanted to go up to Mount Raya, but as we drew near, we realised that the peak was obscured by thick cloud. The only view we would have seen up there would be of a white mist and nothing else. 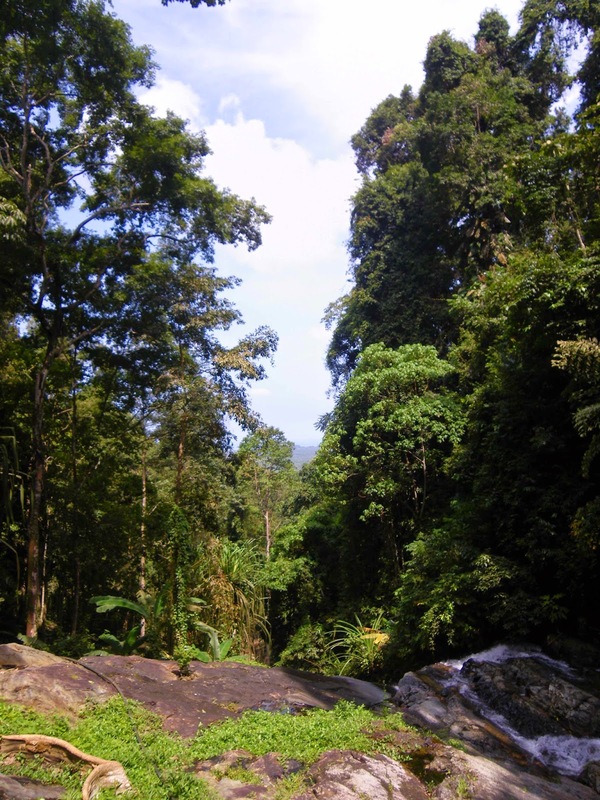 So instead, we first headed to Durian Perangin waterfall. We had the place to ourselves as we walked up the short, staired path to the main falls. We cooled off dipping our feet in the small pool at the base of the little falls. Looking back down stream, there was a lovely view out to sea over the Kilim park through the trees. It was a really peaceful spot. Strangely, an opportunistic photographer had made us take photos near the entrance where the stream ran over a series of small falls and a man-made picnic area. On the way back, he showed them to us and we bought them, mostly out of pity, as there was no-one around and he had no other customers. 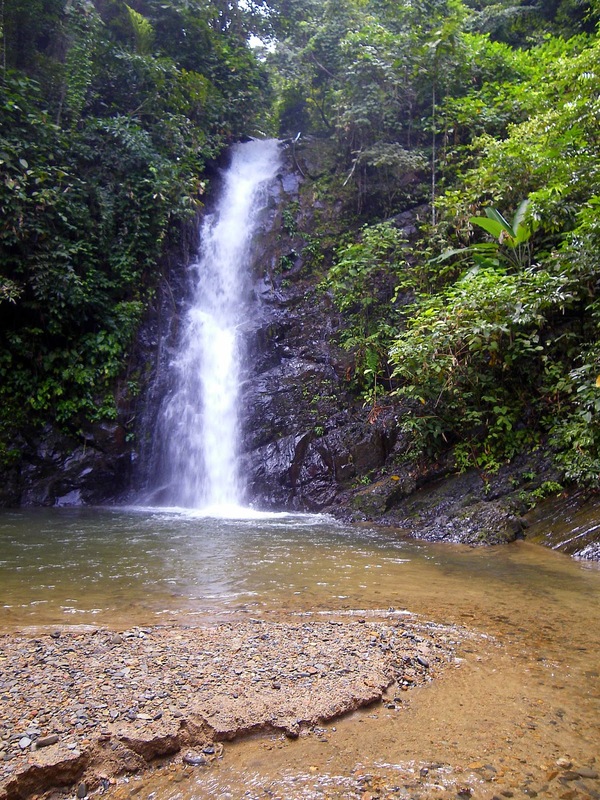 We then trekked over to the other side of the island (read that as driven by our taxi) to Temurun waterfall. The drive was scenic with views out to the northern beaches of the island. 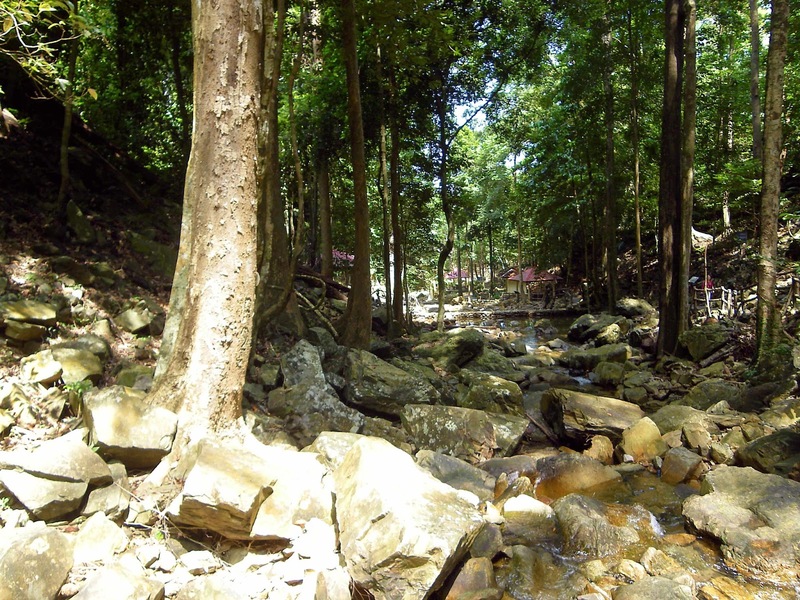 A short, mostly flat path lead to the base of the tall, imposing falls. They were maybe a hundred metres high. Plenty of water was spilling over them, but I could imagine how torrential the flow would be at the height of wet season. 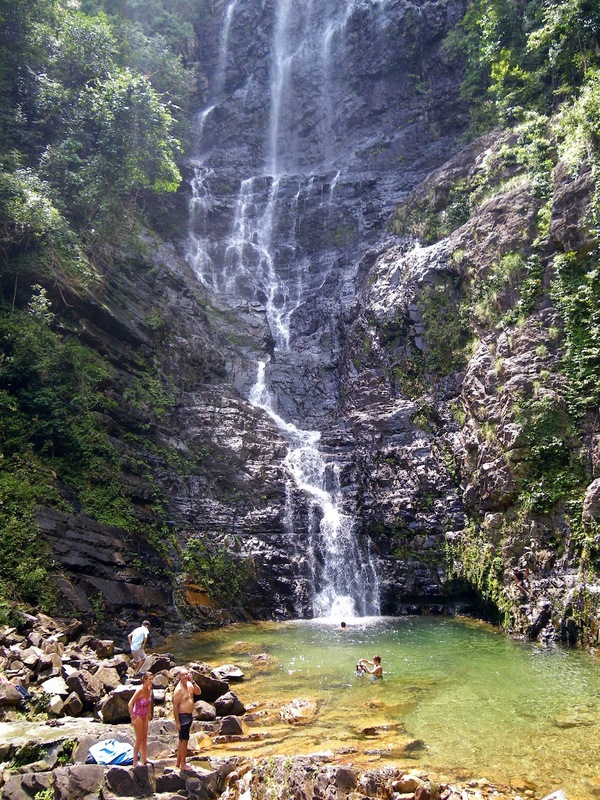 A few other visitors were enjoying a swim and jumping from the rocks into the deep pool below. J and I simply relaxed and wet our feet. 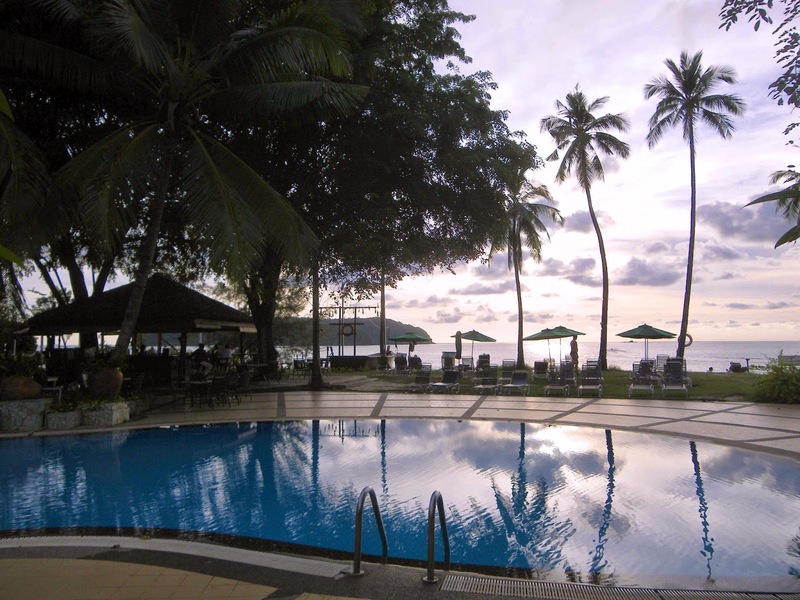 Back at the hotel, we relaxed around the pool for the afternoon before our last dinner in Langkawi. 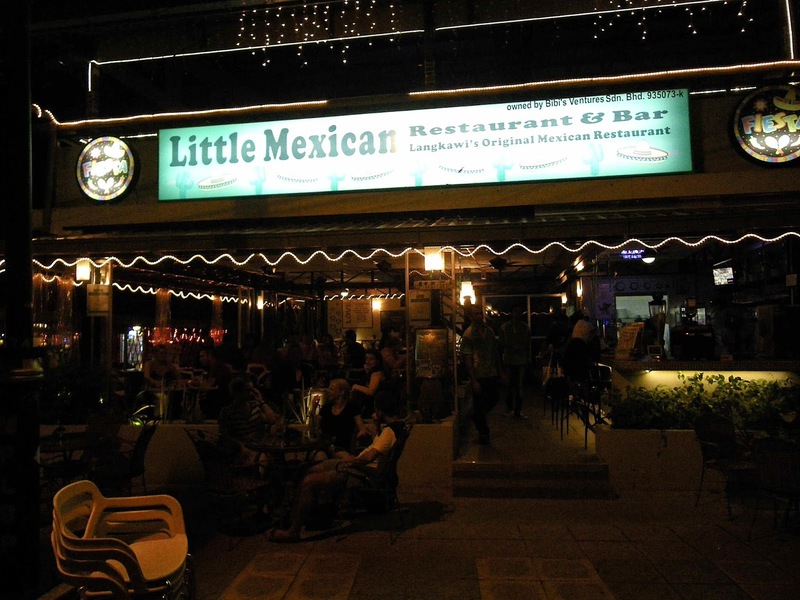 We had already planned it, and I was so ready for another yummy meal at “The Little Mexican” restaurant. And we weren’t disappointed. We hung around after for a few beers, enjoying a chat with the owner about Langkawi and its development over the years. Happily full, with a few beers under our belt, we headed back as a thunderstorm rolled in. Our flight home on the last day was mid-afternoon allowing us to enjoy a sleep in, ample time to pack and have lunch at one of the cafes near the hotel (which was Sun café and was superb!) Langkawi had been a terrific holiday. Splitting the time between one side of the island and then the other worked out really well. 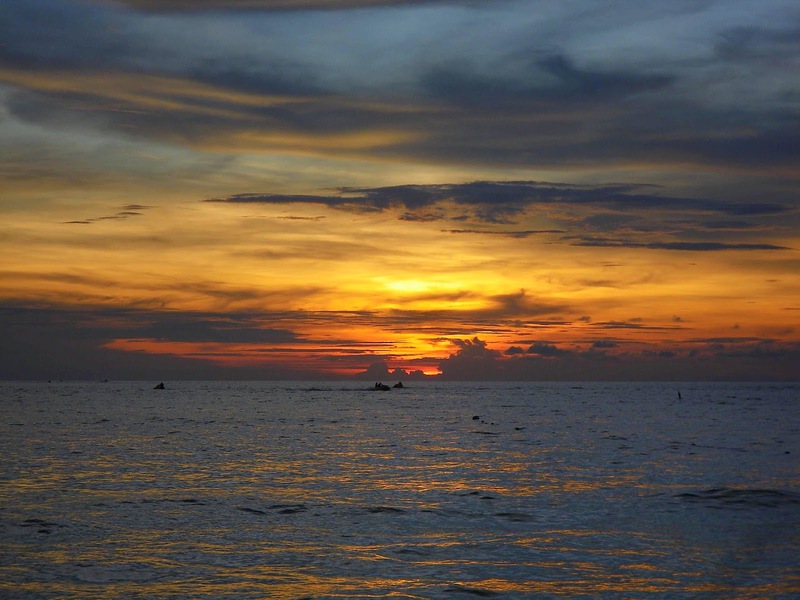 And Koh Lipe – ah paradise – I wish we had spent more time there. 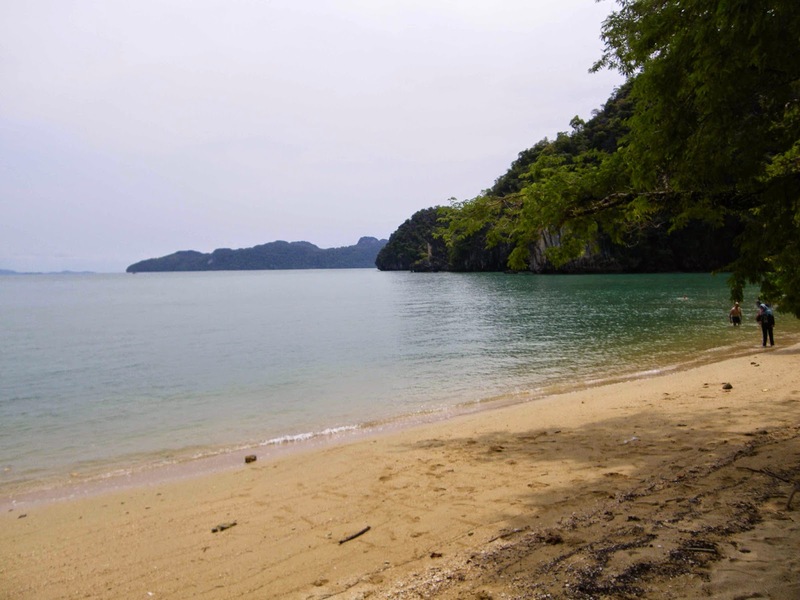 But at the same time, I wouldn’t have wanted to spend any less time on lovely Langkawi.